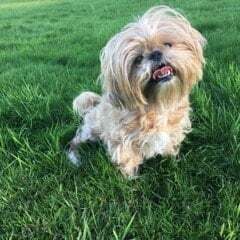 Our 8 year old shih tzu, Maggie had been struggling with bad arthritis in both knees. At times she was unable to walk and needed pain medications and laser therapy in order for her to move around. We had been feeding her Cesar’s for her whole life but decided to switch over to Fresh Pet because of the better ingredients and it was more cost effective. We made the switch about four months ago and have been incredibilty surprise by the health benefits. Now, due to Fresh Pet, Maggie is moving around great and no longer needs pain medication or laser therapy! We never expected this but couldn’t be more happy! Thank you Fresh Pet!